Andalucia is the southernmost region of mainland Spain. South of Extremadura and Castilla-La Mancha, it borders with Portugal and Murcia in the west and east, respectively. In southeast of the province of Cadiz, the British overseas territory of Gibraltar – commonly known as the “Rock” – is connected to Spain by a sandy isthmus. The strait of the same name acts as a natural connection between the Atlantic Ocean and the Mediterranean Sea both of which bathe the extensive Andalucian coastline, and separates the Iberian Peninsula (and Europe) from Africa, just a few miles away. This large historical territory with its ancient cities and vast heritage is a land of striking contrasts. From the main mountain ranges of Sierra Morena and Sierra Nevada (the Mulhacen with 3.482mts is the highest in the Iberian Peninsula) in the Betic Systems, to the arid desert of Tabernas, the invaluable marshes of Doñana National Park, the fertile Guadalquivir River basin flowing into the Atlantic Ocean and the magnificent Costa del Sol and Costa de la Luz, Andalucia has all you could wish for. It comprises eight provinces though our holiday tours cover the western provinces of Sevilla, Cádiz, Granada, Málaga, Jaén and Córdoba avoiding the main hot-spots of mass-tourism associated with the Costa del Sol. Famous for its matadors, sherry wines, spotty dresses, wild fiestas and endless beach resorts, Andalucia has so much more to discover beyond the stereotypes. 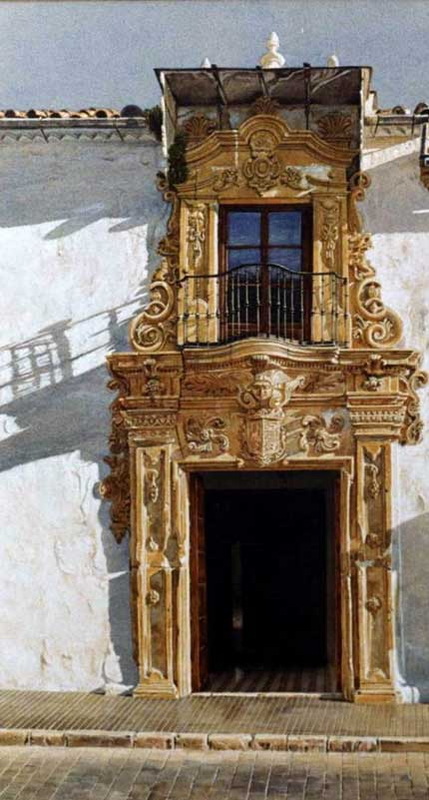 There is no doubt that it is a paradise for art lovers with its ancient cities and villages steeped in history but, if you are seeking a bit more of adventure then Andalucia is also your destination. From the art galleries, beaches and bars of Málaga it’s just a short trip into the mountains where you can walk the vertiginous Caminito del Rey or head into the Grazalema National Park where you can practice all sorts of outdoor activities. Go rafting or canyoning in the dramatic gorges of Garganta Verde or Las Buitreras, enjoy the stunning scenery by walking through the several trekking and hiking trails or discover the Andalucian countryside on horseback. From Granada you can be in the Sierra Nevada in under half an hour and from Córdoba you can head north into the ‘dehesa’ or the Natural Park of Sierra de Hornachuelos – in Andalucia the mountain and the beauty of nature is never far away! In Doñana National Park, the star of the show for nature lovers, you can spend the day exploring its magnificent dunes and marshes – largest in Spain. You will certainly be surprised by the varied wildlife and the hundreds of species of birds. If you are a wine lover, don´t miss a visit to one of the impressive bodegas (cellars) of Jeréz and Salucar de Barrameda to taste and explore the history of the finest sherries in the world. Head into the mountains around Ronda, the Sierras de Málaga, to discover some surprising prize-winning reds from boutique vineyards or south for the sweet, gloopy Pedro Jimenez wines of Málaga – there’s truly something here for all tastes. Considered to be the hottest region in Europe, Andalucia is also a “land of light” with an average of about 3,000 hours of sunshine each year. It is mainly under the influence of the Mediterranean climate with mild winters, hot summers and irregular precipitation. However, this varies from west to east and from the inland to the coast and also depends on the altitude. 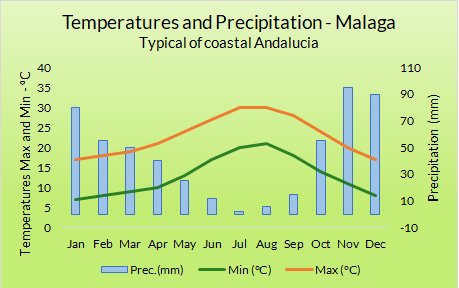 In the south-west, the Atlantic-facing Costa de la Luz is more humid and cooler whilst the Almerian coast, washed by the Mediterranean, becomes hotter and more arid. The fertile Guadalquivir Valley welcomes you with high but pleasant temperatures and winds in Cadiz, getting warmer and warmer as you move inland towards Seville and Cordoba. At high altitudes the temperatures are more intense – harshly cold in winter and extremely hot in the summer. 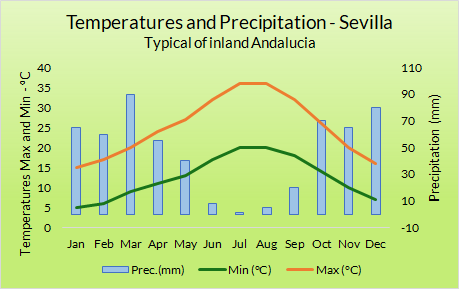 Late March through to early June then mid September to early November are perhaps the best months to visit the region if you want to avoid the heat of the inland plain´s summer – temperatures are milder (pleasantly so) and you can even get a little rain at times. If, however, you’re a hot-house flower or would like to build some beach time into your travels, then the summer months – especially in Costa de la Luz – can be a good bet. In winter the Sierra Nevada is great for skiing and it can be easily combined with a citu visit or some time at the coast where mild weather can still be found. *More info – check the ‘Travel’ tab from within any particular tour for the best options for that trip. We usually include a hire car and we will provide full driving instructions, GPS co-ords for the accommodation and essential information on driving in Spain as well as a touring map of the area. Andalucia´s identity has been shaped by countless influences which can not only be appreciated in its immense architectural heritage but also in its rich and varied gastronomy. In particular the region’s Moorish past and proximity to Africa have made their mark and differentiate the local cuisine from that of the rest of Spain. The other main influence are the region’s truly wonderful ingredients – here you’ll find not only the world’s best olive oil, sherry wines and, of course, cured ‘Jabugo’ ham, but so much more . There’s delicious, fresh fish (including the highly prized blue-fin tuna) and seafood from the Atlantic and the Med and extraordinary meat dishes inland; top-quality fruits such as Huelva´s strawberries or even mangoes in Granada, wonderful goat´s cheese from Grazalema and simple grilled sardines from Málaga – just to mention the most popular delicacies. And of course each province, subregion or city will surprise you with its specialities and local produce. Don’t miss a good “gazpacho”, a delicious “pescaíto frito” or the “tortillitas” of shrimp as you travel around – and once away from the tourist traps (you needn’t go far) you’ll find the generosity of the locals can be quite remarkable. Due to its benign (not to say hot) year-round climate, it is quite usual to eat out in Andalucia. Meals are served quite late, especially in the warmer months but do like the locals and take a siesta and you’ll soon get into the rhythm, as well as avoiding the mid-day heat. If you are too hungry to wait for a full meal or just want to taste a selection of small dishes, then go out for tapas (reasonably priced, sometimes free, bar snacks), combined with the local wines, refreshing sangría or ice-cold beer can turn into a real feast!